Elusive Planet Mercury makes an appearance in the western evening sky during early spring 2016, its best evening appearance of the year. On the evening of April 18 it sets nearly two hours after the sun. 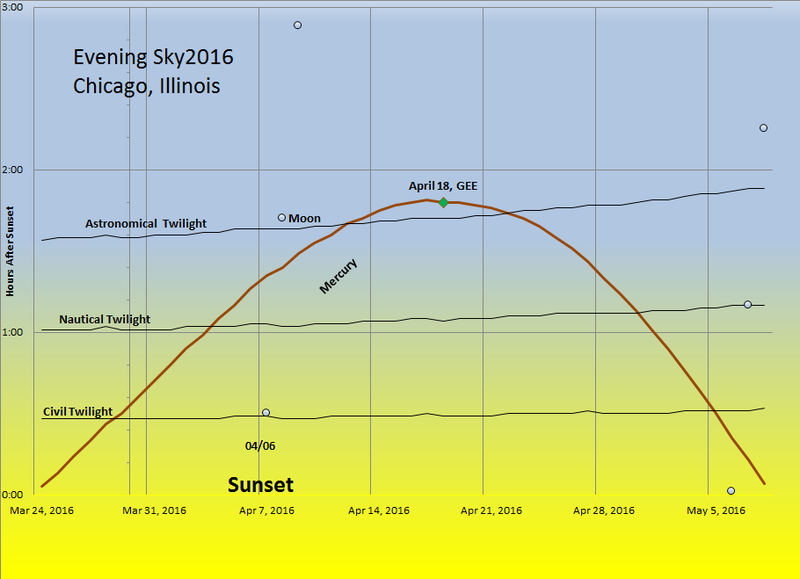 The chart above shows Mercury about 1 hour after sunset as seen from the Chicago area. On this evening Mercury appears about 11 degrees to the lower right of the Pleiades and nearly 22 degrees to the lower right of the star Aldebaran. The brighter stars of Orion (Betelgeuse and Rigel) are included for scale. On the above chart Mercury is about 10 degrees above the west-northwest horizon. Neighbors’ trees or house, likely, could block it. 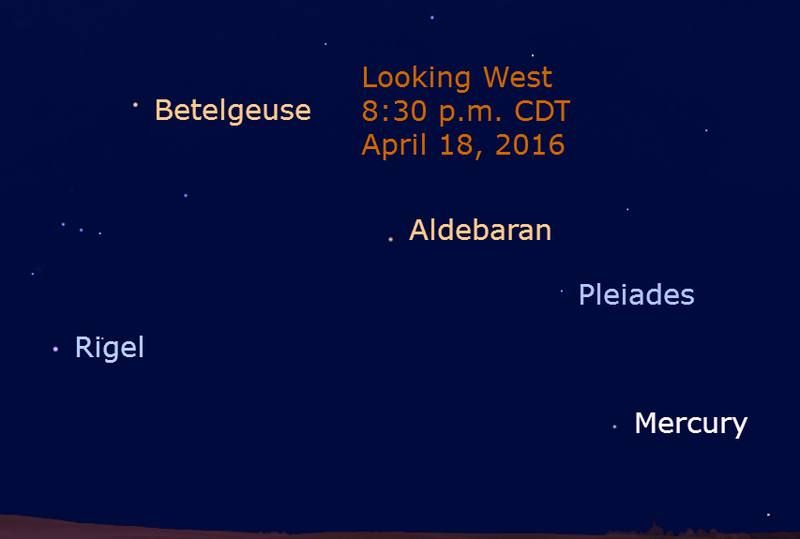 Find a clear view of the horizon Aldebaran and Mercury are about the same brightness. As the planet approaches its greatest elongation, it brightens as it approaches our planet, moving toward its inferior conjunction, between Earth and the sun. The best times to see the planet are around the greatest separation and when it sets before the end of nautical twilight near the end of April. Mercury is best seen in the western evening sky on spring evenings and in the eastern evening sky during autumn mornings. The angle that we see our solar system is best at those times. This link shows a chart for the setting of stars and planets in the evening western sky and this link shows the rising of planets in the eastern morning sky during 2016. The best morning appearance this year occurs during late September.